Growing focus towards clean fuel electricity generation sources coupled with scarcity of land will drive the global floating solar panels market size during the forecast period. Regulators across the globe are setting up numerous target pertaining to clean energy capacity addition to curb the environmental pollution level. In 2015, the U.S. federal government had introduced executive order 13693 with the aim to achieve 30% of the total electricity demand from renewable energy sources by 2025. Stringent regulations to curb the greenhouse gas emissions will drive the global floating solar panels market share by 2024. In 2014, European Union has introduced directive 2003/87/EC with the target to reduce the emissions to 20% by 2020. In 2016, Government of China under its thirteenth five-year plan has introduced its plan to reduce emission level to 18% by 2020. Easy to install and dismantle, adoptability to any electrical configuration, scalability from low to high capacity and minimum requirement of heavy equipment are some of the features which may positively influence the business landscape. Scarcity of land space for setting up ground mounted photovoltaic systems in several countries will stimulate the floating solar panels market growth. Singapore with land area of over 700 square kilometers for over 6 million population is working restlessly with private entities to effectively utilize their waterbodies for deployment of new floating product. Global floating solar panels market from stationary accounted for over 90% of the global volume in 2015 on account of numerous cost benefits associated. Growing adoption across various developing countries including Japan will positively impact the industry size over the forecast period. Tracking floating solar panels industry size for 2015 was valued over USD 4 million and is set to witness strong growth owing to its long durability and high efficiency. Increasing investment by the component manufacturers to reduce the overall cost structure of floating power architecture will embellish the industry size during the forecast period. Global floating solar panels market size for 2015 from 0.1 to 1 MW was valued over USD 0.9 million. Growing utility investments towards the development of small scale photovoltaic projects to cater the rising demand for the off-grid consumer across remote areas will positively impact the business growth. 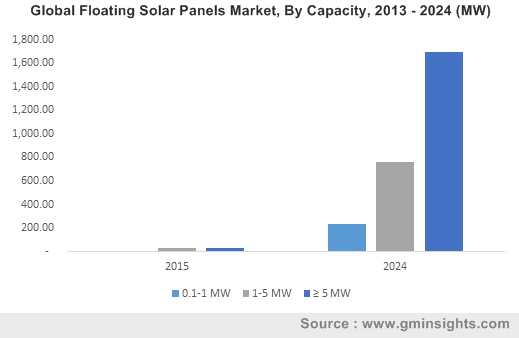 Floating solar panels market from 1 to 5 MW is set to exceed 700 MW by 2024. Increasing installation of the photovoltaic systems by industrial consumers will positively impact the business growth. Growing investments by utilities and private investors towards the deployment of largescale photovoltaic projects across various riverbeds will further complement the industry outlook. On grid floating solar panels market share was contributed over 75% of the global revenue in 2015. Schemes including feed in tariff, subsidies, financial incentives and tax benefits will influence the global industry size over the forecast period. Global market from the off grid is predicted to witness significant growth of over 30% from 2016 to 2024. Implementation of distributed or decentralized power generation systems across developing countries will augment the industry growth. U.S. market size is anticipated to reach over USD 250 million by 2024 owing to favorable government initiatives to increase dependency on clean energy sources. Strong pipeline projects with high potential may favor the business growth. Japan market size was valued over USD 14 million in 2015. Availability of limited natural resources coupled with low land availability will likely to drive the deployment of floatovoltaics systems across the country. In 2016, Kyocera Corp of Japan completed the grid synchronization of world’s largest floatovoltaics power plant with capacity 14.5 MW. UK floating solar panels market share is set to witness strong growth of over 60 % in terms of volume by 2024. Introduction of regulatory norms to limit the CO2 emissions will further boost the business growth. In 2016, the country completed the development Europe’s largest floatovoltaics power plant with cumulative capacity of over 6 MW across Queen Elizabeth II reservoir. China market is predicted to grow at substantial rate of over 30% over forecast timeframe owing to significant decline of PV panel cost. In 2016, the government of China announced investment of over USD 462 million towards the development of world’s largest floatovoltaic plant across Huainan City. Brazil market is set to exceed 100 MW by 2024 subject to growing investments towards the deployment of large floatovoltaic technologies across the country’s vast river beds. In 2016, the country launched first stage of country’s first floatavoltaic plant with capacity of 10 MW. Global industry players include Solaris Synergy, Sunengy Pty, Vikram Solar, Ciel & Terre, Kyocera Corporation, Novaton AG, Yingli Solar, Pristine Sun and SPI Energy. Companies are investing significantly in R&D to develop cost effective technology with high reliability index. Presence of limited global players is influencing the small and local players to easily expand their business size across the region. Floating solar panels generation involves deployment of photovoltaic technologies over water bodies. In the past few years it has appeared as one of the favorable alternative to ground mounted PV systems. The deployment PV components over water surface not only enhance the over CUF of the architecture but also helps in reducing the effect of draught across the nearby area by preventing water evaporation. Floatavoltaic panels holds low maintenance cost and can be easily moved according to the sun’s position.